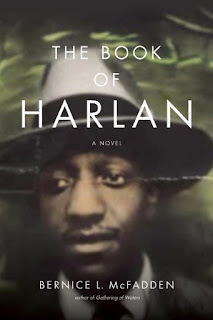 Bernice McFadden covers a lot in The Book of Harlan. Spanning six decades, readers are taken on a journey from the upper class home of an upstanding preacher to the outskirts of the Harlem Renaissance, crossing the ocean to the concentration camps of Nazi Germany and winding its way back to black pride and a humble Brooklyn dwelling. Like I said, McFadden does a lot. Fortunately for readers, she does it well. The daughter of one of Macon, Georgia’s most upstanding citizens is constricting. Emma feels like a caged peacock, placed on display on Sundays as the church pianist, but not allowed to do anything that might be viewed as improper by her parents or society. She might have resigned herself to life as a country girl were it not for her best friend Lucille. Lucille had been singing in the church choir as long as Emma had been playing the piano. Lucille’s singing takes her to places that she and Emma only dreamed about and when she arrived back in Macon, she was a changed woman. Lucille strolled toward her with newly unshackled hips swaying like the back door of a whorehouse. The arrival of this new Lucille is enough to motivate Emma to find herself a piece of a man, so when Sam Elliott comes to town, saying the right things, Emma hitches her wagon to him. Of this marriage comes Harlan, a spoiled and lazy creature whose lackadaisical manner gets him in trouble repeatedly. …perhaps Harlan knew, even in infancy, just what the universe had in store for him. “Is there something wrong with my baby?” Emma asked the doctor. Spoiled first by his grandparents and then by his parents, in an attempt to make up for missing out on his early years, Harlan takes nothing too seriously and everything for granted. His brash manner sends him and his best friend, Lizard, straight to a concentration camp and changes him in unimaginable ways. I love McFadden’s writing. Her characters are smart and fun-loving, but she doesn’t mind allowing them to make mistakes. Harlan is hard headed and almost every bad situation he finds himself in is of his own doing. How long does it take him to realize this and change himself – a long time. But that’s the journey McFadden takes him on. It took his mother awhile to get herself together, so is it a generational curse? I’m not sure. What I do know is that while I was entranced by Emma and her family, I was equally entertained by the Gills, a Barbadian family, and Lizard, Harlan’s best friend who is not as he appears to be. As always, McFadden provides plenty of food for thought. Who else would think to teach us that blacks did indeed end up in German concentration camps? Who else would incorporate whites passing for black, especially at a time when it wasn’t beneficial to do so? Bernice McFadden would, that’s who.